Kris Weinhold grew up keeping aquariums, but really fell in love with planted aquariums in 2004, diving head-first into researching and experimenting with various plants, growing techniques, and aquascape designs. 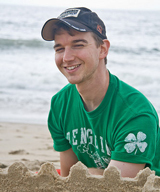 Kris is the vice president of the Greater Washington Aquatic Plant Association, and has published articles in The Aquatic Gardener, Aquarium International, and had his photos appear in several other publications. He also maintains a website/blog (www.guitarfish.org) showcasing his aquarium and nature photography, and his informative articles on aquarium keeping and aquatic plant ecology. Kris's first talk will detail how to get good pictures of your aquariums and their inhabitants, even if you don’t have fancy camera equipment. He will also give some more advanced tips and tricks for those with the fancy equipment. For Kris’s second presentation, he will conduct a demo of using various hardscaping materials to create pleasing displays. Hardscape, or rocks and wood, are the structural foundation of any aquascape, so it’s very important when trying to create appealing layouts in your aquarium.